This piece is completely crafted in Grand Rapids, Michigan by Kindel's artisans. The decorative, low relief Longleaf Pine boughs on the crest rail draw a clear connection the Carolina Sandhills of Pinehurst. 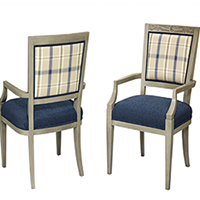 The chair features a curved back that has both an inside and outside upholstered back finished with a double welt. 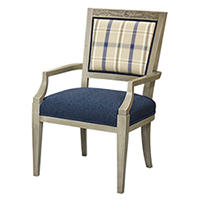 The seat features spring construction for comfort and durability. 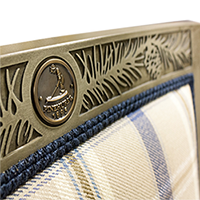 A bronze Putter Boy medallion embellishes the top rail of the chair as an option. A simple, wood disc will be substituted, if desired. Dimensions: Width: 23.5", Depth: 25.75", Height: 37.5"